Here's a cute little project that you can make in those little bits of time you always have during the holidays: chatting with family at parties, waiting for a school pageant to start, watching Christmas specials with your kids for the 12th time. It's a fairly easy knit, so if you can knit, purl, increase, decrease, and change colours, you should be fine! 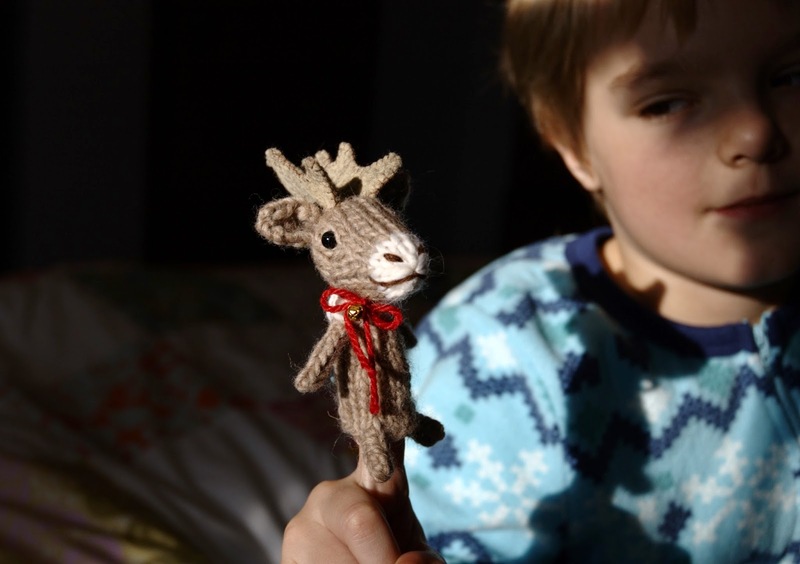 I've made the antlers from felt, but if you hate hand-sewing, and your kids are a bit older, you could use pipe-cleaners (chenille wires) instead. Wouldn't your children be so pleased to find one of these in their stocking? Please note, this is a free pattern, and I haven't had time to get it test-knit. If you find a mistake, or have a question, please email me (barbara at fuzzymitten .com). CO 34 sts with MC. Row 3-7: Work 5 rows in st st.
Row 9-11: Work 3 rows in st st.
Row 13-14: Work 2 rows in st st.
Bind off. Using a length of your MC yarn, sew the tops and bottoms of the feet together with a few whip stitches. With dpns and MC, cast on 3 sts. Work in I-cord for 5 rounds. Cut yarn, thread end through remaining stitches, and pull tight to gather. If you don’t want to work the arms as I-cord, cast on 4 sts, and work in st st for 5 rows. Cut yarn, thread end through remaining stitches, and pull tight to gather. Then sew arm seam towards cast-on edge. Start at back. CO 6 sts with MC. Row 5-9: Work 5 rows in st st.
Row 13-15: Work 3 rows in st st.
Cut yarn, thread end through remaining sts, and pull tight to gather. Attach safety eyes or beads, or embroider eyes with black yarn. Sew seam, leaving an opening. Stuff head, then sew closed. Embroider a nose and mouth. Row 3-5: Work 3 rows in st st. Pass first stitch over second. Cut yarn, pull end through rem st, then thread yarn end along side of ear to cast-on edge. Sew cast-on edge of ears to head, then weave in yarn ends. Sew cast-on edge of arms to body, then weave in yarn ends on WS of body. 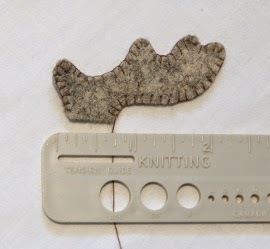 Sew body’s back seam from cast-on edge to bound-off edge, leaving the bound-off edge open, for sewing to the head. Sew head to open bound-off edge of body. Weave in yarn ends. If you like, add a bow and jingle-bell. *You should be able to click on the photo above, and then print it. I have tried to make the photo so that it will print at the correct size to use as a pattern for cutting out your antler pieces. But if it's not the correct size, just use it as a guide for the shape. All reindeer have different antlers anyway! P.S. 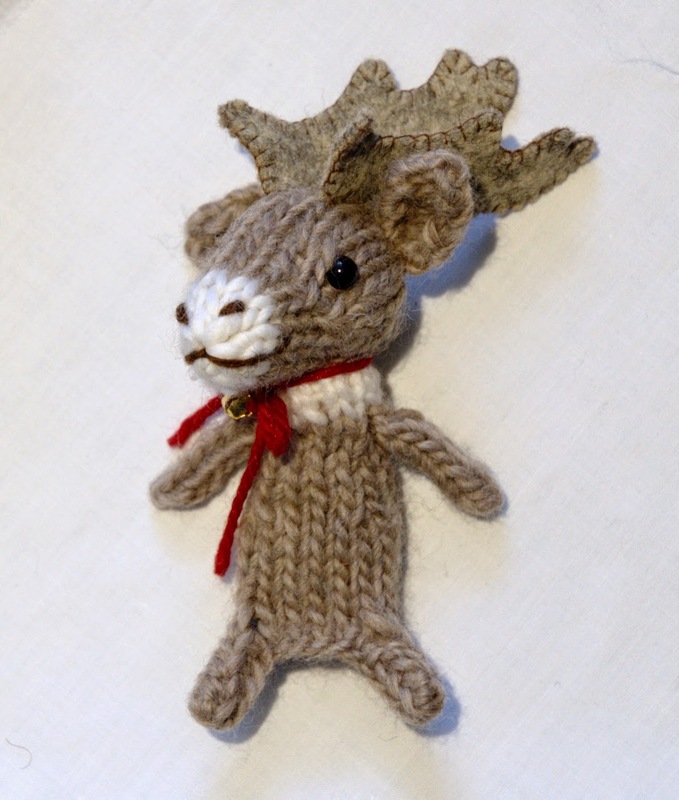 If you want to make a whole family of finger puppets, the body from the reindeer will work with any of the heads from my Wee Wuzzies pattern. You'll just need to knit it in the appropriate colours. m1 = increase 1 by picking up loop between stitch just worked and next stitch, from front to back, and knit into the back of this loop.